The Udzungwa Mountains are part of the Eastern Arc Mountains, the arc which begins in Taita Hills in Kenya, and in Tanzania runs through the North and South Pare, the East and West Usambara, and the Nguu, Nguru, Ukaguru, Rubeho and Uluguru mountains and Udzungwa. 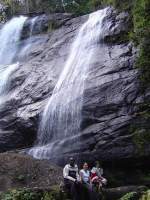 The Udzungwa mountains are situation between the towns of Morogoro and Iringa. The Udzungwas are 10,000 sq mtrs in total covered in wet humid climate providing water for Kilombero valley. The Great Ruaha provides electricity for much of the country. Rainfall in the southeast of the mountains amounts to 2,000 mm per year and on the Northwest rain shadow area it decreases to 600 mm. Temperatures range from 21-27 centigrade on average. 0n your arrival at Dar es Salaam International Airport you will be met and transferred to the hotel in town for Dinner and overnight. Depart from Dar Es Salaam, drive Man'gula camp at Twiga Hotel for your dinner and over night. Wake up, breakfast, pack up camp, and descend to base of Waterfall. 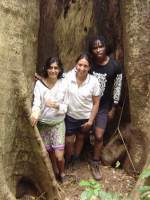 One hour hike to Sanje village, depart for Dar Es Salaam. First night camp is at Twiga Hotel just outside the park - it is a local hotel, very clean, with a bar and local cuisine. Second night camp is at Sanje waterfall. - Porters to carry tents, camp equipment and utensils, water and food. However, hikers will carry their own sleeping bag and personal belongings. -You should bring the following items with you. If you don't have them, we may be able to rent some of these items to you on request. -Shoes and clothes suitable for hiking, and rain coat.